This image shows Virginia Gov. Ralph Northam’s page in his 1984 Eastern Virginia Medical School yearbook. The page shows a picture, at right, of a person in blackface and another wearing a Ku Klux Klan hood next to different pictures of the governor. It's unclear who the people in the picture are, but the rest of the page is filled with pictures of Northam and lists his undergraduate alma mater and other information about him. President Donald Trump weighed in on the controversy over Virginia Gov. Ralph Northam and a racist photo by linking the image to abortion and electoral politics as well as bigotry. 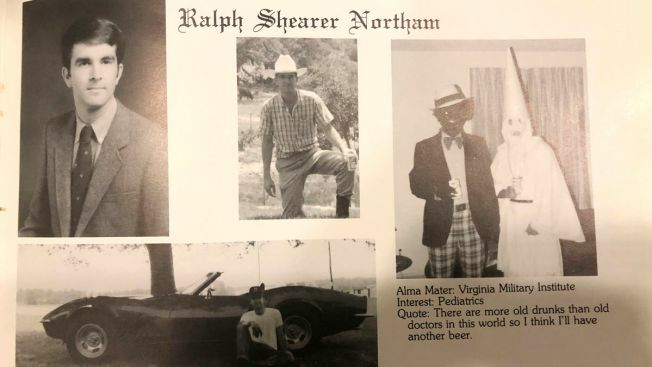 Democratic officials in Virginia and nationally urged Northam to resign after news reports of the photo, which appeared in Northam's 1984 medical school yearbook and showed a person in blackface and a person in Klan regalia. Northam refused to resign, however, and said Saturday that he was not either of the people pictured. In tweets Saturday night, Trump criticized Northam over his recent comments on late-term abortion. He also said that Northam's Republican opponent in the 2017 gubernatorial election, Ed Gillespie, would have won had the photo turned up during their campaign. Earlier this week, abortion opponents accused Northam of supporting infanticide. In a radio interview, the governor described a hypothetical situation in which an infant who is severely deformed or unable to survive after birth is left to die. Trump tweeted after those comments that "Democrats are becoming the Party of late term abortion." As calls mounted Saturday for Northam to resign because of the photo, Trump tweeted: "Democrat Governor Ralph Northam of Virginia just stated, 'I believe that I am not either of the people in that photo.' This was 24 hours after apologizing for appearing in the picture and after making the most horrible statement on 'super' late term abortion. Unforgivable!" In a second tweet, Trump wrote: "Ed Gillespie, who ran for Governor of the Great State of Virginia against Ralph Northam, must now be thinking Malpractice and Dereliction of Duty with regard to his Opposition Research Staff. If they find that terrible picture before the election, he wins by 20 points!" The tweets came hours after Del. Kathy Tran, who sponsored a Virginia bill that Northam defended on the radio, canceled a town hall meeting due to "safety concerns" as the governor dealt with calls to resign. A group of anti-abortion activists continued to demonstrate against the bill.